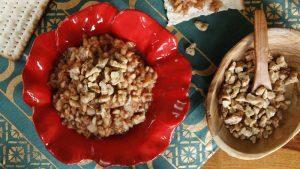 Home > Blog > Amy Campbell > Butter or Margarine? Butter versus margarine. Given the amount of passion and controversy this topic raises, you’d think we were talking about the presidential race. Undoubtedly, you have an opinion based on what you use. But what’s the real deal behind the debate? I don’t think you’d get much of an argument about the taste of butter. There’s nothing quite like melted butter on an ear of corn, a bowl of popcorn, or a slice of straight-out-of-the-oven bread. But we know that taste doesn’t necessary equate with health. Coloring and salt may be added to butter. Unsalted butter is available, too. 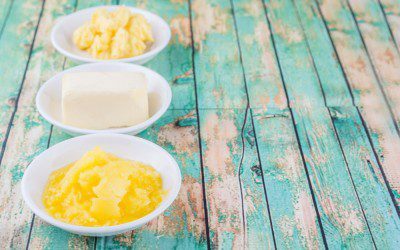 In addition to vegetable oils, margarine may contain salt and other ingredients for flavor, color, and texture. Some brands of margarine contain phytosterols, which are plant substances that help to lower cholesterol. Still others tout claims of containing omega-3 fatty acids or yogurt or being non-GMO. There’s no shortage of options, that’s for sure. If you use margarine, it may be because you were told (or heard) that margarine is healthier to use. That advice stems from the fact that butter contains saturated fat (a type of fat believed to raise LDL, or “bad,” levels of cholesterol), while margarine contains unsaturated fat, which is considered to be healthier. However, the issue with margarine, especially stick margarine, is that it may contain trans fat, an unhealthy fat that can raise LDL cholesterol and lower HDL, or “good,” cholesterol. Tub or spread margarines are generally free of trans fat, though, and many brands of stick margarine no longer contain trans fat (but read the label to be sure!). What about dietary cholesterol? Good news: Dietary cholesterol has been granted a reprieve. The 2015–2020 Dietary Guidelines for Americans no longer consider cholesterol to be a nutrient of concern. However, the Guidelines continue to recommend limiting saturated fat in an effort to lower the risk of heart disease. So, is butter’s bad rap deserved? It’s a complicated question to answer. The reality is that neither option is “good” for you. Both contain calories and saturated fat. Despite some of the claims that you see on the Internet, butter isn’t exactly a health food. But if you’ve been avoiding butter like the plague, or are feeling a bit guilty about slathering butter on your baked potato, you can probably loosen up, at least a little bit. A review study that was recently published in the journal PLOS ONE at the end of June showed that butter intake was only “weakly associated” with total mortality, not with heart disease, and maybe slightly protective against Type 2 diabetes. Before you run to the grocery store and stock up on butter, keep in mind that this study didn’t prove “cause and effect.” In other words eating butter isn’t going to give you a health boost, and it’s too soon to know if it really could, say, protect against diabetes. The authors of this study also are careful to point out that while butter seems to be a better food choice than refined carbs, such as white bread, it’s not as good a choice as many vegetable oils, like olive, canola, and flaxseed oils, and even some types of margarine. • Butter isn’t a health food. There’s no conclusive evidence that eating butter will make you healthier. And it still contains saturated fat, which hasn’t been exonerated. But small amounts used as part of an overall healthful eating plan should be fine. • Reach for vegetable oils first. Continue to cook with them, use them to make salad dressings, and even as a dip for bread. • If you decide to “stick” with margarine, skip the stick and go for a tub or spread margarine. If you prefer stick margarine, choose one that contains 0 grams of trans fat. Look for margarines with no more than 2 grams of saturated fat per serving. • If you go with margarine, you might choose a brand that contains plant sterols, such as Benecol or Take Control. • Keep in mind that both butter and margarine contain calories. If you’re watching your weight, consider using a whipped or light butter, or a light margarine. A literary giant shows Amy Mercer that sharing pain is a form of healing. Bookmark DiabetesSelfManagement.com and tune in tomorrow to learn more.